Email Client is a program or web application that is designed to receive, write, send, and keep your email messages. Before the user starts using the email service, usually the email client requires several settings. These settings include an email address, password, POP3/IMAP and SMTP address, port number, email alias, and other related preferences. The most popular email clients are Gmail, Apple Mail, Outlook, Yahoo!Mail, and Hotmail. 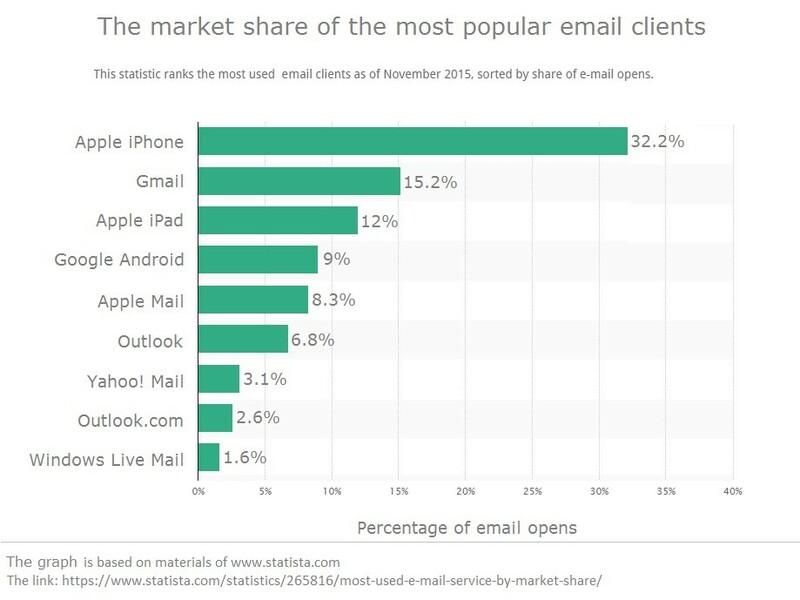 The statistics in the graph below show the market share of the most used email clients of the world in 2015. During this period, Apple iPhone accounted for 32.2% of email opens and Gmail accounted for 15.2% of email opens. If you decide to start email marketing for your business, the most important thing you should know about email clients is their daily limit on sending messages. With their help, you can send only 500 messages per day. Of course, this number doesn’t suit many big companies. For this purpose, you can try an email service provider like SendPulse to send a generous amount of email messages every day. Also searched with "Email Client"
Rate this article about "Email Client"
If you are interested in "Email Client" you might be interested in our bulk email service.